A small, once dirt-poor Mexican village now hosts one of the largest concentrations of modern artists in the world. In fact, for the 1,200 residents of Mata Ortiz, high-quality ceramics have become more than an expression of culture—they have become a way of life. Retired business executive Terry Haller recently decided to get in his car and drive through Mexico. During his journey, Haller stumbled upon Mata Ortiz, a village located in the foothills of the Sierra Madre Occidental mountains about 80 miles south of the New Mexico border. Here, he was amazed to find beautiful pottery produced by the townspeople. Spurred by curiosity, Haller sought out the origin of this town’s deep interest in pottery-making. He discovered that a large-scale movement began to create this pottery in the 1970s. Centuries of influence predate this movement, however. Twenty miles north of Mata Ortiz lies the pre-Columbian adobe ruin of Paquimé. Here, ancient people created and traded fine pottery, bits of which archeologists still find at this site. In the 1950s, Mata Ortiz native Juan Quezada, the son of a poor farmer and the sixth of 11 children, developed interests in the pottery of the Paquimé people. 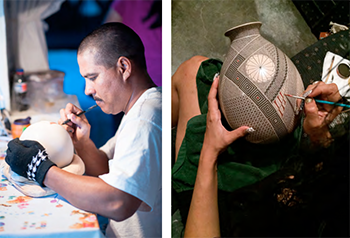 Over many years, Quezada learned about the Paquimés’ methods of finding clay and forming, painting, and firing their pottery. Though Quezada worked primarily as a farmer, he managed to replicate the Paquimé process of making pottery. In 1976, he traded six of his pots for used clothing at a small trade store in Deming, New Mexico. Soon after, American anthropologist Spencer MacCallum visited this trade shop. Stunned by Quezada’s beautiful pottery, he pledged to find their creator. Upon finding Quezada, MacCullum offered to serve as Quezada’s benefactor: he would pay the artist to produce pots full time. Thus, the Mata Ortiz pottery phenomena began. Quezada trained his family and friends to make the pottery, too. In fact, by 1995, over 400 of the town’s people took on pottery-making as their primary means of livelihood. Mata Ortiz potters have developed their process throughout the years. First, potters search for their base—clay—in the hills surrounding the village. Next, they place this clay into buckets to soak it. After passing the clay through cloth strainers, potters then use plaster-of-Paris molds coated with vegetable oil to form the bottoms of their pots. Unlike many modern potters, they do not use wheels. Mata Ortiz potters often fire their pots over self-made pits in their back yards. Today, the legend of Mata Ortiz is international. Collectors from around the world select pottery produced in this village. Later this month, from June 13 through 15, the Madison Museum of Contemporary Art (MMoCA) will hold a series of events and exhibits featuring Mata Ortiz and its inhabitants’ pottery. Free Press writers look forward to these events and the opportunity to hear about Terry Haller’s experiences with the people of Mata Ortiz.